To celebrate over 40 years of success, Triadd Software Corporation are pleased to share our modernization roadmap for Gain including updates, new features and an improved licensing & support model. As part of Triadd’s campaign to make Gain more accessible and intuitive for our customers we will release a series of product upgrades which will be backed by enhanced or new services. In May 2019, Gain will feature a new reporting module which utilizes Microsoft SQL Server Reporting Services (SSRS). The SSRS release version of Gain will be 4.1.9s. For users with current Support and Maintenance license(s) for their instance of Gain RM 4.1.8 the upgrade will be free*. *as long as SSRS is installed on the same server as the Gain database. For users unfamiliar with SSRS, it has been Microsoft’s reporting platform for many years meaning it is has become an industry standard and trusted by lots of companies. Triadd are a proud Microsoft partner and we chose to enhance Gain with a flexible reporting platform as it allows customers to integrate modern reporting requirements into their existing reporting processes and applications. We also chose SSRS as a stepping-stone to provide our customers with the ability to adopt full cloud services, including Microsoft Power BI which we are currently exploring for our next generation Gain reporting platform. As an added benefit, SSRS is part of the SQL Server family and customers with up-to-date instances of Standard or Enterprise level versions of SQL Server in their environment can often deploy SSRS on the same server as the licensed database installation without the need of any extra licensing purchases. If the SSRS installation will be deployed to a different server, customers must ensure they have licensed the server accordingly with a current Microsoft Windows Server and Microsoft SQL Server license. Triadd are happy to assist with your licensing enquiries, please reach out if you have any questions. With the upcoming 4.1.9 upgrade customers will still have the option to maintain Crystal Reports as the reporting layer with Gain. An updated version of Gain (4.1.9c) will be available for customers choosing to remain with Crystal Reports. Customers should be aware that Triadd have made a strategic decision to utilize the Microsoft platform and SQL Server Reporting Services (SSRS) for reporting within future iterations of Gain and will not be pursuing further Crystal Reports development. For customers who wish to continue to use Crystal Reports Triadd will happily provide extended support services for previous Gain releases. Beyond the initial 4.1.9s release, we plan on updating and enhancing existing SSRS reports with new insights and mobile reporting functionality, including cloud service capability. Triadd intend to offer an additional reporting solution based on Microsoft Power BI which we expect to launch later this year. Microsoft Power BI is now becoming the new industry standard for all reporting requirements for any size organization and offers some great ‘value add’ capabilities including integration with other Microsoft data services (Office, Azure, Dynamics) and non-Microsoft sources too. Microsoft Power BI enables a modern and intuitive approach to reporting and information consumption. We are excited to be creating new and visually stunning reports that introduce new data perspectives and reporting metrics to your Gain data. Every Gain RM 4.1.8 customer with an existing Triadd Support and Maintenance Agreement will receive a free upgrade to Gain 4.1.9s. Gain RM 4.1.9s delivers the latest SSRS reporting experience, while Gain RM 4.1.9c provides the typical Crystal Reports experience. Both versions (4.1.9s and 4.1.9c) will contain the same security updates. Gain RM 4.1.9 (s\c) includes security improvements, application enhancements, and a new UI with all the same functionality as the previous version. For Gain’s new security improvements, our development team removed the original dependency from OLE DB Provider, TLS 1, and TLS 1.1. Now users will be able to sign into Gain utilizing the .NET SQL Server Native Client 11. As a corporation that understands the true meaning of value, we offer several ways for our clients to make the most out of their Gain experience. One of the ways is to ‘Bundle’. Get the best discount and fastest implementation by purchasing a package which is pre-configured and ready to go. Included is a pre-configured scanner, printer, and a licensed Gain production environment. This bundle includes installation support. We also offer other package offerings including a virtual machine (VHD \ VHDX) with a standard or customized environment to suit your business. We’ll save you time by pre-installing a designated Operating System, SQL Server instance, and Gain. Finally, Triadd Software Corporation is in the works of developing a new on-premises solution for customers who want to have the highest security and end-to-end control of their Gain platform. We call it ‘Gain-in-a-box’ – a scalable, hassle-free solution which meets the needs of your entire records management business, anywhere you need it. We’ll take care of everything meaning customers receive a solution which is ready to run, with all the essential hardware or services and on-site support and training required. You can be up and running in less than a day – we guarantee it. More details on ‘Gain-in-a-box’ and other new services will follow as they become available. Stay tuned! A pre-configured solution with everything necessary to run Gain 4.1.9s. Hosting it through Triadd Software Corporations (IaaS) managed service offering. If you would like more information on our managed and professional services, please contact our sales team. Our biggest announcement yet….! We are pleased to announce that Triadd Software Corporation plan on releasing our next generation version, Gain 5 in the Spring of 2020. In the highly anticipated Gain 5 release we provide a fresh and responsive interface which is designed to support users with all their record management needs including physical, electronic and digital assets. Gain 5 will feature accessibility updates over time, including color-blind theme support and improved text\font readability. Beyond improved visuals, customers are offered the choice to utilize industry-branded themes where Gain boasts the ability to switch between customizable interfaces, color-scheming, and labelling based on your business or industry needs. There’s more! The Gain platform will move from Classic ASP to .NET, allowing us to create a far more extensible solution which can integrate with other third-party solutions including Sharepoint, ImageSilo and LaserFiche. Another big win for us is that it means our historical DLL dependencies for legacy scanner support will be a thing of the past (massive applause all round) meaning full portability of Gain and the ability to scan wherever your Wi-Fi reaches to. All customers will also receive critical SDK updates optionally through Triadd or through Microsoft’s Windows Update process where applicable. Simpler, easier, safer. The new release also includes security improvements. Users are given the option between logging in with a basic login, 2-step verification, or windows authentication. Administrators can keep better track of their users with improved access logs. Expect a newer, sleeker, better enterprise records management solution with Gain 5! We heard you! Customer feedback is how we prioritize our development focus and your input drives us to create better and more intuitive features for Gain including more options for deployment. With our virtual (IaaS\virtual machine) and SaaS (Software as a Service) offerings, Gain installation and maintenance will be a thing of the past because we will take care of everything for you. Save time, manageability and overhead costs. You only need to fill us in on the details and we’ll take care of the installation and setup. We can even provide knowledgeable staff to manage Gain for you - just let us know what you and we handle everything else. Triadd will still provide an on-premises \ server-based installation and support for customers who wish to deploy their data and applications on a personal server instead of or additionally to using our hosted, virtualized or managed service offerings. 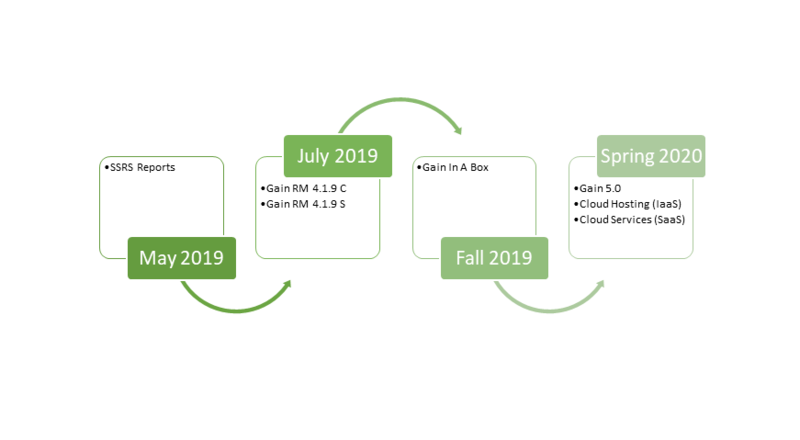 Triadd Software Corporation will be implementing a new pricing structure for all Gain customers beginning July 1st, 2019. For more information please contact our sales team. Starting July 1st, 2019 all customers must obtain a “Software support and maintenance license” for each environment or instance of Gain, along with the required “Application registration license”. Regardless of deployed environment (i.e. production, development, training, test, and/or failovers), each “Software support and maintenance license” and “Application registration license” will cover one (1) application environment or instance and associated database. For customers opting to use the Gain scanner software feature, all scanners must be purchased and supported via Triadd Software Corporation. Each Gain scanner software license includes installation and configuration of the Gain scanner software on one (1) physical scanner and one (1) physical desktop. This does not include annual support fees. As an addendum to the previous Support and Maintenance agreement, each individual scanner environment may only be paired with a single desktop/server environment.